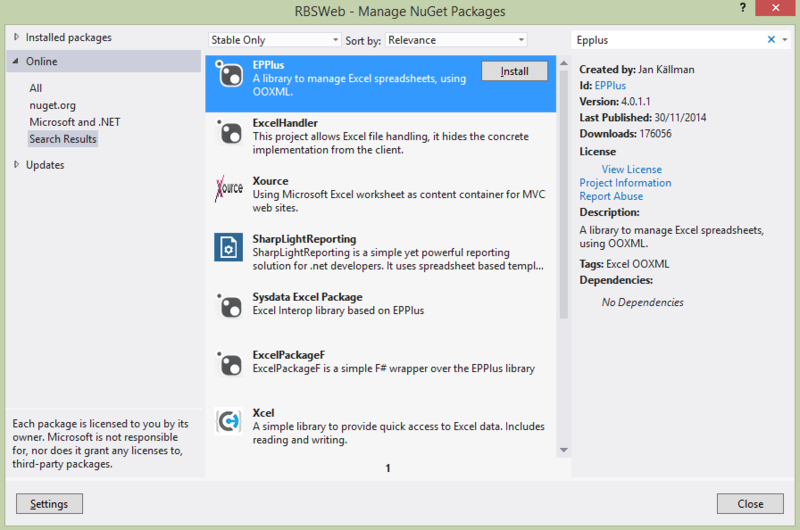 Add EPPlus package using Nuget. Include OfficeOpenXml and OfficeOpenXml.Table namespaces at the top. In your event handler, write the below code. In the above code, what we are doing is first of all, clearing the Response and setting the ContentType and Header for the Response object. This is to be noted that “application/vnd.openxmlformats-officedocument.spreadsheetml.sheet” is the type to be set for Excel 2007. Once these are set, we are getting the Data Source of the GridView in a DataTable. Then, we use an object of ExcelPackage class to create a worksheet and load the DataTable into the worksheet from Cell A1. Calling the AutoFitColumns() ensures that the Excel file written is auto set to fit the column contents. Once the data is written and the excel file is created in memory, we write the same back to the browser. This allows users to either open the Excel file or save it their hard disks.